The Chicago web designers tip of the day. Here is a little short and sweet thing for you to check out on this amazingly warm Chicago afternoon, it’s 40 deg F and I have just been out WITHOUT a coat on! If you have a Google account click HERE and see if the profile Google has of you, is correct. They use information gathered from your web browsing history ( if you have that enabled) to show ads more relevant to your interests. But it seems not all profiles are correct. Here are the categories and demographics of my profile. Amazingly I only seem to have three interest categories which is a little odd as the very nature of my web and graphic design job, means I run a huge gamut of searches across a wide range of subjects and industries. Secondly they have me pegged in the 25-34 age range …which is sweet … but incorrect. Just about the only thing they got right was my gender. 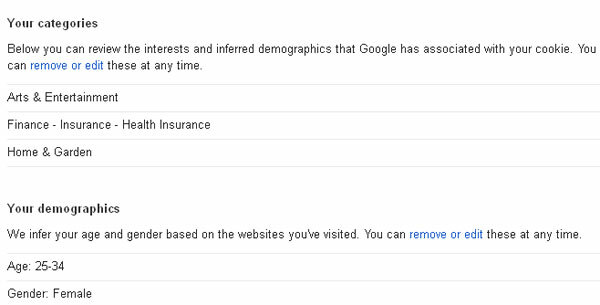 Google allows you to remove or edit anything you like and also opt out of the tailored ad system completely. Does Google have your profile correct? This entry was posted in Chicago Web Designer, Google, Indigo Image Tips and tagged Chicago, Chicago Web Designer, Google. Bookmark the permalink. ← Screenr.com: A video tutorial tool.